Map of Chili. Map of Brazil, Bolivia, Paraguay and Uruguay. 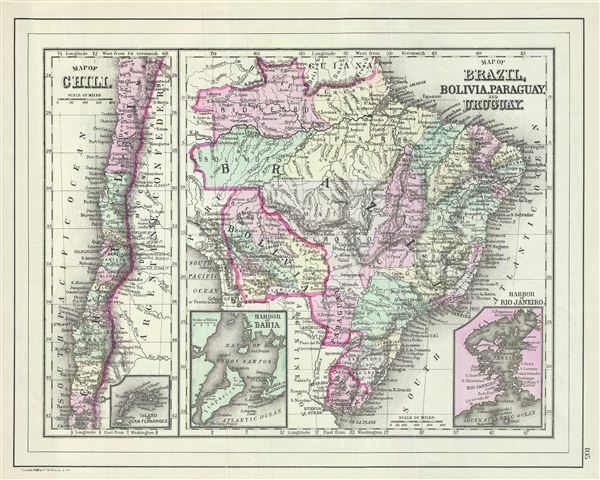 This is a fine example of William M. Bradley's 1887 map of Chile, Brazil, Bolivia, Paraguay and Uruguay. The map is divided into two parts. The map on the left depicts chili with an inset map of the Island of Juan Fernandez. The right hand maps shows Brazil, Bolivia, Paraguay and Uruguay with inset plans of the Harbor of Bahia and the Harbor of Rio de Janeiro. Following General Jose de san Martin's defeat of the Royalist forces and the subsequent liberation of Argentina, european and other Latin American settlers flocked to the region with dreams of rich farm lands and other natural wealth. Various towns, cities, rivers and an assortment of additional topographical details are noted. Map is color coded according to regional and political boundaries with elevation rendered by hachure. Copyrighted 1887 by Wm. M. Bradley & Bro., for issue as plate no. 105 in the 1887 edition of Mitchell's New General Atlas. Very good. Original platemark visible. Map of Europe on verso.